Caregivers of the Potomac is a very unique home health care agency that caters to the needs of affluent retired professionals and older adults who wish to delay or avoid the need for Assisted Living and Nursing Home facilities. 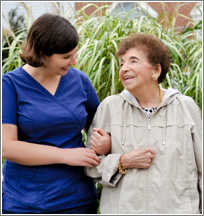 We take assisted living services into the homes of older adults so they do not have to move. We help older adults live life their own way-in the comfort of their home safely and happily doing exactly what they enjoy doing for as long as it is possible. Melody Warner is the state director of the Maryland Elder Care Planning Council. She is a Registered Nurse, Geriatric Aging Specialist, and Elder Care Advocate. Proudly serving the greater Baltimore and Greater DC Area.